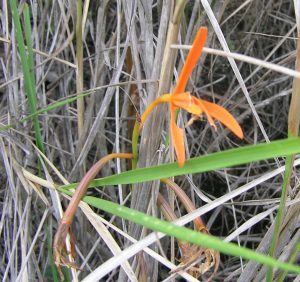 The last week in January is officially ‘orange week’ as we feature and impressive group of orange flowered species the first of which is this firework of an orchid from Brazil. 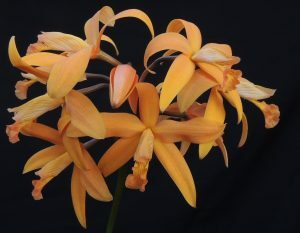 Cattleya cinnabarina, which until recently was listed as Laelia cinnabarina, is a lithophyte from Brazil and one we have seen growing on steep granite slopes near Novo Friburgo in Rio State. The first photo shows the Cattleya with the last, rather tatty, flower on its spike and seed pods forming. The second photo shows the habitat of bare granite with scrubby grass and villosia shrub. 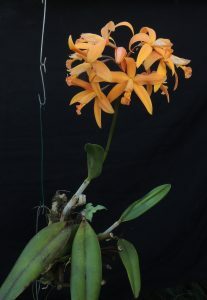 As we don’t have and scrubby granite slopes to hand in the greenhouse we grow Cattleya cinnabarina mounted on a large piece of cork and grow it high in Cool Americas in bright light above our pleurothallis and Masdevallia species. It seems to enjoy these conditions and has produced two of these grand spikes of flowers this year. The natural habitat is notably dry in the winter and we replicate this with heavy watering in the summer and infrequent sprays (avoiding flowers and buds) in the winter. Lovely flower and colour. 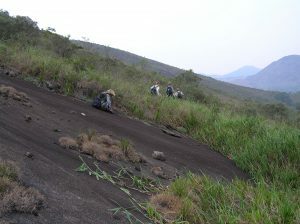 It is great to see the photo of it in-situ and also of its dry habitat in Brazil.